Lee Vallely has dedicated her life to movement and wellness. After an eight-year career as a professional ballet and modern dancer in New York and San Francisco, and 20 years as a teacher and consultant in the health and wellness industry, Vallely saw a need for a higher level of education and a commitment to the precision of movement. In 2007 she moved from teaching Pilates for other clubs, and developing and managing large corporate fitness programs in Austin and around the country, to teaching small-group training programs. 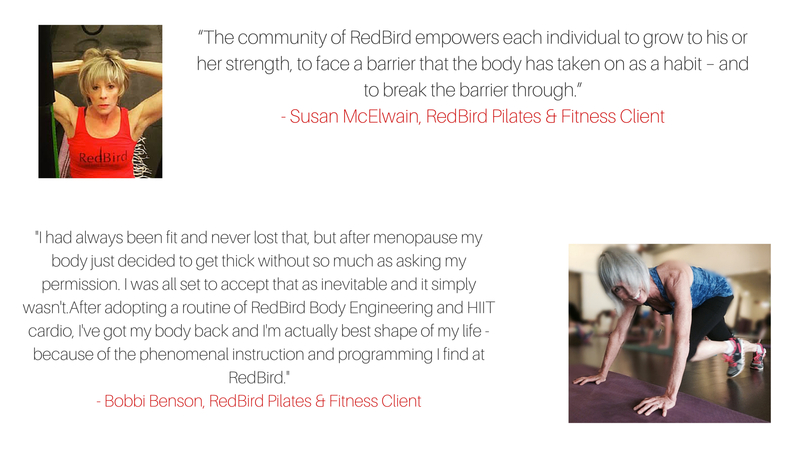 RedBird Pilates & Fitness has grown every year since then, necessitating four moves to progressively larger studios. Lee and her team of teachers—all handpicked from RedBird’s intensive 450-hour teacher training program—provide high-touch, technically oriented classes using a definitive methodology that emphasizes precision movement and proper body alignment. Earlier in her career, Lee was the national director of corporate sales for Gold's Gym International. She designed and built the chain’s first corporate sales division and managed their national sales team. Prior to Gold's Gym, she was an owner of eight Austin-based World Gym locations, where she won Best Corporate Fitness Program for five consecutive years. Lee spent her early years in the fitness industry as senior fitness director for the YMCA of Austin. Lee is a BASI and PMA-certified Pilates teacher, a certified trainer through the American Council on Exercise and an accredited fitness specialist with the national YMCA. She holds a Bachelor of Arts degree from the University of Alabama in Birmingham with a specialization in dance. Want to transform your body, get out of pain and into the joy of movement – but find time and budget constraints keep you from getting to work with the experts? Want the quality of a boutique studio in the convenience of home? Frustrated with mediocrity and lack of accountability in online programs? We got you! Fundamentals of Pilates Mat, HIIT Cardio and Body Engineering, along with key modifications to protect you in the process. Important postural and alignment principles that prevent injury, reshape the body and preserve the longevity of movement abilities. How to innervate the deep muscles of the core. Pilates principles and how they can elevate movement skills and transform bodies. How to correctly and safely perform gross muscle movements like squats, pushups, planks and more that will be important for HIIT training. How to access and awaken the deep muscles of the hip and shoulder joint to reshape your body in RB Body Engineering. A true understanding that it is not WHAT you do but HOW you do it. We are going to teach you to do it RIGHT. Want to know an insider fitness secret? Training results come less from WHAT we do than from HOW we do it. You can workout hard, but if it isn't smart, you put yourself at risk for NEGATIVE returns, burnout and chronic or acute injury. Learn to move with precision, create balance, improve posture and alignment and gain access to science-based programming built on efficient, effective movement strategy and well-designed sequencing that gives you the results you want for your time and energy. Imagine working out on your schedule, in your home with experts who have created a method and studio that has changed thousands of lives and thrived in the competitive Austin fitness market since 2007 - because of REAL results. Do I need equipment? You need a mat, possibly a towel to pad your knees, athletic shoes for the cardio, water and some floor space. No other equipment is required for this series. I am already an athlete/really fit/ workout all the time, do I need to do the fundamental work? At RedBird we believe it is not WHAT you do but HOW you do it. Sometime the more athletic we are the more undesired movement patterns we have developed in the course of our training. The RedBird method is all about learning to recognize and neutralize undesired habitual movements, innervate underutilized but important postural muscles and change the way we live in our body from a deep intrinsic level. In order to achieve those goals, it is important to start with small, precise movements and work up from that solid foundation. Athletic folks can often make the picture, but it isn't coming from the right place--and therefore they won't get the results they want. We encourage everyone to spend sometime in fundamental and work up from there! How often per week do I need to do this to see results? Generally, you need to move your body everyday! We are physical beings that are meant to move! But you don't have to do RB360 everyday. To get the most out of these classes we recommend that you do them two to three times per week. Repetition is key to mastery, so do each video until you feel confident in your ability to perform the movements correctly - with precision and right alignment. Then progress to more videos and/or use these body mechanic tools to complement any other movement practices you enjoy - from walking to swimming to yoga or weight training. It is safe to do these classes up to five times per week, but build up to that. What if I am confused about a movement or concept? With the all-access pass we add you to our RB360 Facebook group that can help you understand our method and ask questions - which will be answered by our master trainers! P.S. We have a BONUS! Sign up this month for RB Movement 101 and get free access to our RB Facebook group to connect to a community of like-minded, inspiring movers and have your questions answered by master RB teachers!